From classic Doctor Who episode The Twin Dilemma. 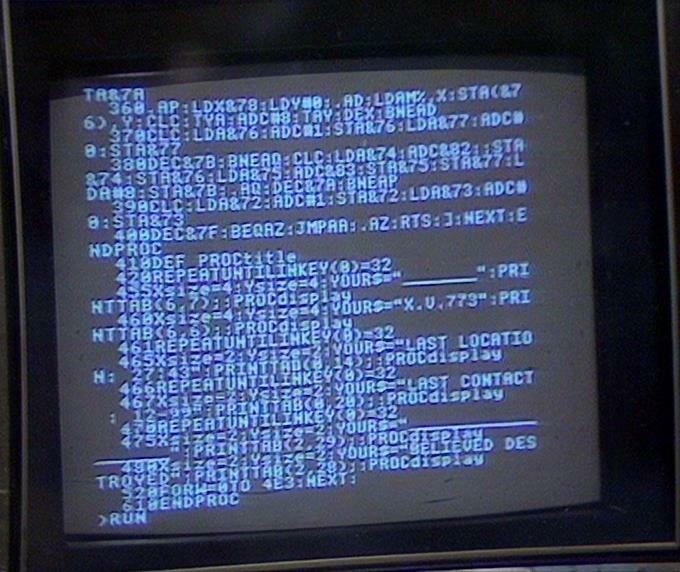 The source is BBC Basic, and it controls what is on the screen later in the scene. Line 420 of the code waits for the spacebar to be pressed and then updates the display (either pressed by the actor or someone off screen). I Should Coco from Tim Moore on Vimeo. Little local trail, testing out rear view on the Nomad. With Virb overlays. Still having compression issues. Trick of upscaling to 1080 didn’t help so went back to original resolution and frame rate. Main annoyance is the overlays. Seems to be the amount of motion where there’s an overlay makes it worse. When it gets to smooth or less motion then they’re clearer. Don’t get why some 720 or 1080 videos are pin sharp on YouTube, and likewise Vimeo, but mine compress to hell but are sharp on the original and the versions I optimise for YT/Vimeo (using Handbrake and all the recommended settings and bitrates). Super Slo-mo Mini Jump Edit from Tim Moore on Vimeo. Resolution a bit low shooting at super slo mo. Looks better if not full screen. Afan – Blade (2016-05-07 ) – Happy Life from Tim Moore on Vimeo. Afan, Blade Trail – Happy Life. With overlay. Garmin VIRB Basic, 720p60, bar mounted. Set video quality to 720p60 HD if not already set, for best quality.